Spirulina is the most complete natural food of our planet. It also remains an undeniably effective dietary supplement due to its therapeutic values. Unlike other microorganisms such as yeast and Chlorella, Spirulina is rich in micro nutrients easily assimilated by the body. She holds the record in its proportions of protein, iron, vitamins B12 and betacarotene any other known food. It is twice as high in quality vegetable protein than soybeans. It contains many vitamins E as wheat germ. Calcium, phosphorus, and magnesium are present in the same amount as in the milk. Its rate of chlorophyll (antiseptic, healing) is one of the highest in the plant kingdom. It contains superoxide dismutase known to destroy free radicals responsible for skin aging. Finally, it is one of the few foods (with breast milk and hempseed oil) to hold the important gamma linolenic acid in immune balance. All this makes it an excellent food supplement. Malnutrition is the most powerful scourge of our planet. It kills more people than wars and natural disasters combined. 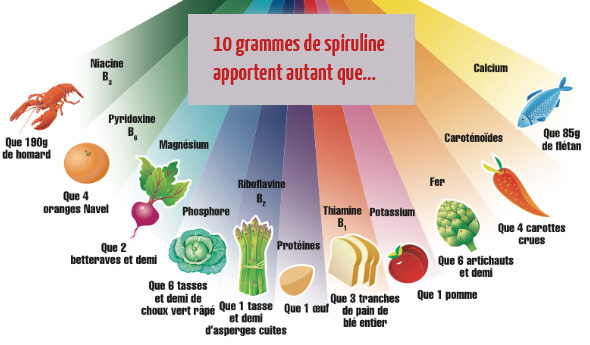 Spirulina can respond effectively against malnutrition and the many ONG now integrates with their programs. Undisputed expert in the cultivation of the microorganism, the Antenna TechnologiesIndustry Association demonstrated by clinical trials that the absorption of a daily dose of 1 to 3 grams of spirulina for 4 to 6 weeks enough to cure a child with severe malnutrition, kwashiorkor or marasmus type. Directly assimilated, spirulina has a digestibility equal to that of human milk. It requires no cooking and consumption shows no cons-indication or limitation. Anticancer effects, research has confirmed the effectiveness of Spirulina against the pancreatic cancer and prostate cancer. The use of algae to feed livestock is an ancient skill. It is even reported that cattle in Britain went himself at low tide near shore to graze stranded seaweed. Roads were built to facilitate access to the animals to these resources. This use of algae is recognized throughout northern Europe, particularly on coasts and islands. Various preparations made from seaweed and oats, for example, have existed. Today, farmers are faced with a problem of autonomy protein that spirulina could solve. Indeed, in intensive systems, protein intake is via soybeans imported from Brazil and the United States and often genetically modified. Even in grassland systems, farmers are facing the same problem during the 3 winter months. Spirulina can be a dietary supplement quality, and produced locally. One could imagine including value spirulina second choice (lumps sweepings) in animal feed: laying hens, chickens, cows racehorses, fish, shellfish, shrimp larvae, etc. It improves their health, appearance, quality or performance. Spirulina is a big oxygen provider. Forests play an important role in the storage of carbon dioxide (C02). Trees are the best plants to fix carbon: 1 up to 4 tons per year per hectare. But Spirulina is even more effective: in the California desert, it may set up to 6.3 tonnes of carbon per ha / year; at the same time it will generate 16.8 tons of oxygen (ha / year). Cleaning system: François Haldermann exhibited at the Mialet symposium on spirulina (June 2002), its ventilation system made in Ecuador to digest the organic matter accumulated in the culture media. It goes well with a BOD (biological oxygen demand) 15mg to 8mg BOD. This aeration system allows complete recycling of the culture medium while maintaining high productivity of the basins. Another example: the Earthrise farm (California), water is recycled in the basins after filtering and dewatering. In fact, significant losses of water are evaporated. The protein from Spirulina consumes 1/3 of the volume of water necessary for the soy protein, 1/5 of the water required for the wheat protein, and only 2% of the water required by the beef protein ! In this case, only 30 liters are required to produce 10 grams of Spirulina. This is actually much less than 55 liters of water required for a half loaf of bread, 245 liters for a glass of milk, or 4900 liters for a hamburger ...! Given its high productivity, spirulina require 30 times less of culture surface as soybean, 40 times less than corn and 300 times less than the beef. Spirulina consumes much less fresh water per kg of protein than any other food 3 times less than for soybeans, 6 times less than for maize, 50 times less than beef. Its production is very costly in energy (including solar energy and the energy supplied). Energy efficiency (energy generated in kg / energy consumed per kg) is 5 times that of soybeans, two times that of maize and 150 times that of beef. Although Spirulina grows in water, it requires much less water per kilo of protein produced than any other food (plant or animal), and reached again a record! "The skin of the face and whole body, like every living substance subject to the law of aging. Some of the changes due to aging are inevitable, but others can be controlled. Thus we have chosen and tested over the years all products whose effects and quality have been results but no higher than the efficiency of Spirulina. "(Engineer Sophie Petitperrin, contact ANNEX 1). Spirulina is rich in natural beta-carotene acts as an antioxidant complex, in synergy with other carotenoids in microalgae. It is also an important source of the enzyme superoxide dismutase (SOD), the antioxidant activity is important. Spirulina is going to participate effectively in the fight against free radicals of oxygen and thus help to slow the aging process. The content of vitamin A stimulates skin pigmentation and helps to tan more quickly and evenly to the sun. Vitamin B5 content: allows the skin to retain moisture and flexibility, and protects hair against chemical and mechanical stresses. Vitamin B8 content: Reduces sebum excretion, the main cause of hair loss. The use of certain varieties of algae as a means of regularly enriching the land is a former expertise common to the people of northern Europe. The widespread use of chemical fertilizers after the Second World War put an end to such practices. Today, some companies specialize in the production of organic fertilizer. Biomass rejected by the spirulina cultures could be valued in this direction. 7 ... and even biological control against mosquitoes! Male mosquitoes from Spirulina ponds would be sterilized by high pH of the culture (according to an Indian study) and basins would then constitute a biological control method against mosquitoes.